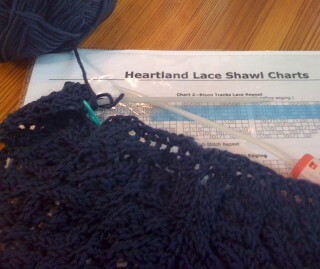 Inspired by the shawl on window model at Unwind in Burbank, I am starting Evelyn Clark’s Heartland Shawl.This is one of the great advantages of visiting LYS to see what they have on display. Of course, Ravelry can be helpful in this way as well but you can get the full real life experience. The pattern was a winner in a competition run by Wild Fibers and is now free from Evelyn Clark’s website. Evelyn Clark’s patterns are wonderful; they contain clear instructions in words and charts. 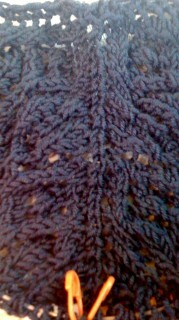 I am using the five skeins of blue-gray baby cashmerino by Debbie Bliss that I snagged at the Webs Tent Sale in May. While I’ve heard that this yarn tends to run short in terms of yardage, it’s hard to get upset when they cost $3.00 a ball. It’s a pleasure to work with since it’s so soft. I want to make a new shawl to substitute for the grey mohair shawl that I made a few years ago from Tess Designs Curly Locks, a mohair and merino blend that I am getting tired of. As I usually do with lace, I am using stitch markers to track the pattern repeats and safety pins to mark each set of pattern rows. Have you knitted any Evelyn Clark Shawls? If so, what did you think of her patterns?